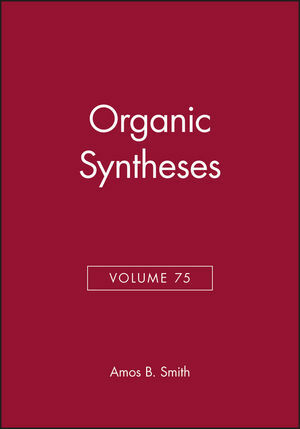 Volume 75 of the Organic Synthesis series contains 29 carefully checked and edited experimental procedures describing leading-edge synthetic methods, important reagents, and useful building blocks. Amos B. Smith was born August 26, 1944 in central Pennsylvania. Amos Smith’s chemistry career and nearly all can be seen manifest in his published work (700 manuscripts), leadership of Penn’s Chemistry Department (Chair, 1988-1996), efforts in our professional community (Founding Editor-in-Chief, ACS Organic Letters, among many other activities), and in the 350 undergraduate, graduate and postdoctoral students whom he has mentored. Catalytic Asymmetric Allylation Reactions:(S)-1-Phenylmethoxy)-4-Penten-2-OL (G. Keck & D.Krishnamurthy). Ethyl (R)-2-Azidopropionate (A. Thompson, et al.). [1.1.1]Propellane (K. Lynch & W. Dailey). N-Benzyl-2,3-Azetidinedione (C. Behrens & L. Paquette). Preparation of Cyanoalkynes: 3-Phenyl-2-Propynenitrile (F.-T. Luo,et al.). 2-Trimethylsilylethane-Sulfonyl Chloride (SES-Cl) (S. Weinreb, etal.). 4-Dimethylamino-N-Triphenyl-Methylpyridinium Chloride (A. Bhatia,et al.). 6,7-Dihydrocyclopenta-1,3-Dioxin-5(4H)-One (K. Chen, et al.). 3-Cyclopentene-1-Carboxylic Acid (J.-P. Depres & A.Greene).